Award-winning Scottish author Christopher Brookmyre teams up with Brighton's RedBedlam, bringing Hell to virtual worlds. What would it be like, asks RedBedlam's shooter Bedlam, if you could live in a video game? Sure, you could do be anywhere, do anything, consequence-free; even death no longer has meaning. But then you realize something. You'll never see your family and friends again, and death is no release from whatever war-torn hell you find yourself in. Christopher Brookmyre, award-winning novelist and an FPS fan from the days of Doom, is collaborating with the Brighton-based developer to put you in this virtual nightmare, and his novel tie-in is already out in hardback. 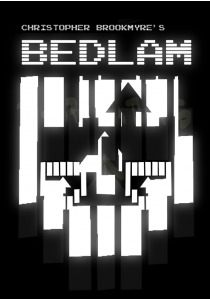 "Bedlam is a tribute to gaming in all its forms and the part it has played in all our lives," says Brookmyre, "as well as being a top quality FPS adventure in itself." The game will take you on a whirlwind tour of action and genres, from arcade platformer stuff to the gritty realism of modern warfare. You, poor shlub with a day job, aren't the hero. You're the kind of walking target the hero shoots at all day long. You want to get out? Fine; but there's no map to the exit, and if you want to stay out of trouble, you'd better stay one step ahead of mystery organization Integrity. Two more novels and games are planned, after your first visit to Bedlam. Brookmyre's a long-time gamer who grew up as the technology grew up, "from blobs on the screen," he told me in a 2011 interview, "to genuinely impressive, rendered 3D graphics," and the thrill back then, for him, was exploration, not crouching behind oh-so-boring cover. "Even the more manic games like Serious Sam, I'd be quite keen to get rid of everybody, so I could go for a walk." "It does an injustice to level design, and the art of level design, if you can't go for a tour of the level." Brookmyre's novel Bedlam is due out in paperback January 21st, 2014. There isn't a concrete date for the game; it should be on Steam summer 2014.